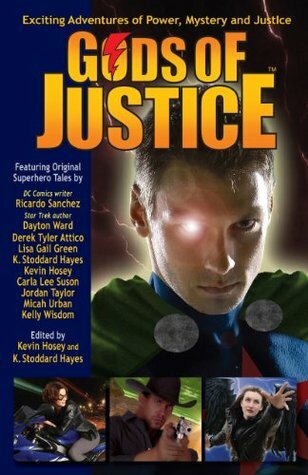 Gods of Justice features ten stories, each by a different author and set in its own universes, giving diverse experiences at the applications and implications of superpowers. Some people are about to discover their superpowers; some are confronted with new challenges; others are called out of retirement. Be it the present or future, Earth or elsewhere, the different settings are easy to get into.My favorites were probably "Identity Crisis", about a teenager who finds out her twin sister is a superhero; "Blunt Force Trauma", about a murder-mystery surrounding an old teammate; and "The Dodge", inexplicably set on an Old West planet and starring a sheriff who must keep his power a secret from everyone.Least favorites were "Neutral Ground", set on the battlefields of World War I; "Breaking the Circle", about a temporal paradox; and "The Justice Blues", about an abusive superhusband.If I understand correctly, this anthology's primary format is an e-book, which may've contributed to the occasional lack of copyediting, allowing "bowls" to be substituted for "bowels", for example. But such issues are rare and don't occur where they could confuse. This contains an amazing story by Jordan Taylor, and one of my favourites of hers (and it's hard to choose). B+; some good stories and ideas in here. Kevin Hosey K. Stoddard Hayes Ricardo Sanchez Dayton Ward Derek Tyler Attico Lisa Gail Green Carla Lee Suson Jordan Taylor - Kevin is a writer and editor. His short stories have appeared in anthologies from Simon and Schuster, W.W. Norton and Cliffhanger Books. Besides writing speculative fiction, he also enjoys creating weird illustrated humor. His cartoons have appeared in calendars, books, newspapers and magazines, including Starlog. Visit him at kevinhosey."